Ms. Kennedy is seeking Hillary Clinton’s Senate seat. There you go Sarah. Had you been able to truthfully say all those things about Alaska and yourself, Ted Kennedy would have never questioned your qualifications. Oh, wait–you could and did say those things. By the way, how ironic and is it that Caroline Kennedy was an Obama supporter but now she seeks Hillary Clinton’s Senate seat. More of that Clinton – Kennedy love going around there in New York. What is more entertaining than politics? Kennedy was somehow “qualified” to be on Obama’s Vice President search team along with 150 million other equally qualified Americans. Kennedy intimates that Obama has encouraged her to seek the Senate seat. Also, it’s probably a fairly safe bet that Oprah supports Caroline Kennedy’s selection as the next New York Senator although I doubt that Oprah is resident of the New York district. The current unelected Governor of New York, David Paterson, has the important privilege of selecting a replacement for Hillary Clinton as Senator from New York, assuming her selection as Secretary of State will be confirmed by the Senate. Kennedy is out on the campaign trail but there is only one voter, Governor Paterson. I doubt that Governor Paterson can resist the power and influence of the royal Kennedy family and the Obama “support” as well. Queen Caroline clearly believes that she is qualified to be a U.S. Senator because she can draw four people from the New York Times to come to a coffee shop to talk to her. Caroline clearly believes that because she is member of the Kennedy family royalty, she would be a great choice as a Senator. Kennedy wants to put her personal power to work for average people. How she would or could do that is grossly speculative but nevertheless, I am confident she truly believes her own nonsense. When the NYT ask her about how she arrived at the decision to seek the Senate seat, her response was somewhat pathetic. Are any of you laughing out loud. “Someone” (either a person who is so totally like, you know, insignificant or, uh, a mystery person) dropped off like 200 Kennedy for Senate signs at her husband’s office. No doubt, from that point on, Caroline thought about what a easy ride into prime time politics this would be. By the way, as I attempt to write in the same lame language that Kennedy speaks, I find myself wondering how anyone seeking a seat in the U.S. Senate can speak so poorly. Wikipedia states that Caroline used the “you know” mental gap filler 168 times in a 30 minute interview. 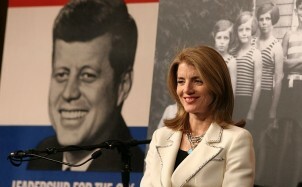 If Caroline Kennedy was a Senator and was asked to filibuster, she could, like you know, go on and on for days. My twelve year old daughter has better grammar and speaking abilities. Another reason Caroline believes she is qualified and the best one for the job is that she has authored several books. She claims to have written two books on the Constitution and two on American politics. Actually, she co-authored a couple of books with Ellen Alderman in 1991 and 1995, and is listed as “editor” on four other family related books. Apparently, Caroline did author A Family Christmas on her own. Nevertheless, how difficult would it be to convince a publisher to publish any book for you if you’re Caroline Kennedy, regardless of the content. I was just thinking, I would love to publish a book, and maybe someday I will. I am quite certain that if I were the son of the late President Kennedy, I would have little trouble finding a publisher for most anything I were to write. So, forgive me, but I am really hard pressed to recognize her literary experience as a legitimate qualification to be a United States Senator. Regardless of the number of well qualified and experienced candidates in the state of New York, Kennedy will be soon be the front runner and most likely selected. However, I say this; if Caroline Kennedy wants to seek public office and attempt to serve the citizens of New York, then she should emulate the Profiles In Courage and seek the Senate seat in the 2010 general election. Better yet, she could seek the Governor’s job–that position will be up for election in 2010 as well. I know this is risky, but submit a comment and let me know what you think. Next Next post: How The U.S. Government and AIG Are Funding Hostile Islamic Activities!